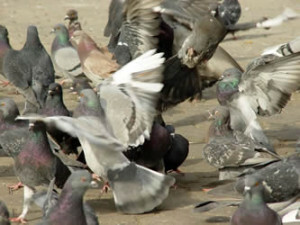 Birds are usually classified as a pest species when they roost on buildings or in public areas. The most common complaints in Louisiana that prompts you to search for answers for bird removal and control include the following: Pigeons roosting on or in building Pigeons leaving droppings everywhere Canada Goose droppings everywhere Woodpeckers destroying wood home Chimney Swifts living in chimney For these reasons, many people wish to have bird exclusion barriers installed or even have the birds removed. Birds generally considered “nuisance birds” include pigeons, house sparrows, and starlings. For more information on birds Please Click Here The presence of these birds in unwanted areas can cause damage to property, and their droppings may create unpleasant odors. Bird droppings can also ruin vegetation, painted surfaces, gutters and awnings, and cause electrical equipment to malfunction. Birds may carry diseases which are capable of infecting humans, and bird droppings can promote soil conditions favoring development of such fungal diseases as histoplasmosis. House sparrows can damage rigid foam insulation, and their nests can become fire hazards. The first step in your bird control program should be identification of the pest bird; if you cannot positively identify the bird, consult an expert before taking action. The Migratory Bird Treaty and Endangered Species Acts prohibit trapping or killing of most birds, eggs or nests without a permit. House sparrows, starlings, and pigeons are not protected under these Acts, but may be covered under local ordinances, so be sure to consult with local wildlife authorities. Habitat modification and exclusion from structures are generally the most effective ways of controlling nuisance bird populations. Note where birds are roosting, nesting, and landing; look for nests and droppings. Eliminate potential food and water sources if possible. If you are attempting to clean up an existing bird problem, be sure to clean up all dirt, nests, and bird droppings prior to installing any bird control devices or deterrents; this will not only give a clean surface for installation/application, but will prevent pest birds from reusing nest material or following their own scent trails back to old roosting sites. Since bird droppings can harbor parasites, bacteria, and disease causing organisms, a thorough cleaning will also help protect those who will be installing bird control devices or deterrents. Be sure to wear protective clothing (face mask, gloves, coveralls) if cleaning up a large accumulation of wastes, and be sure to launder protective clothing separately. service available in Monroe, West Monroe, Ruston, Bastrop, Alexandria, and Pineville in the North and Central Louisiana area. East Carroll, Franklin, Grant, Jackson, La Salle, Lincoln, Madison, Morehouse, Natchitoches, Ouachita, Rapides, Richland, Sabine, Tensas, Union, Vernon, West Carroll, Winn and surrounding communities. Farmerville, Harrisonburg, Homer, Jena, Jonesboro, Kinder, Lake Providence, De Ridder, Oak Grove, Oberlin, Marksville, Monroe, Natchitoches, Rayville, Ruston, Saint Joseph, Tallulah, Vidalia, West Monroe, Winnfield, Winnsboro.